Yom Kippur, the holiest day in the Hebrew calendar, will be observed tomorrow and Monday with communal prayer services for Oahu Jewish congregations. 735-8161, meets in the Ala Moana Hotel, 410 Atkinson Drive. Reservations are required for the Sukkot holiday meals. Tomorrow, 6:30 p.m. Kol Nidre. Monday services from 10 a.m. to 3:30 p.m., Yizkor at 11:30 a.m., Neilah from 5:45 to 7 p.m.
Friday, 7 p.m. services followed by holiday meal. 10 a.m. services and kiddush; 7:30 p.m. services followed by holiday meal. 10 a.m. second-day service, 11 a.m. children's service. 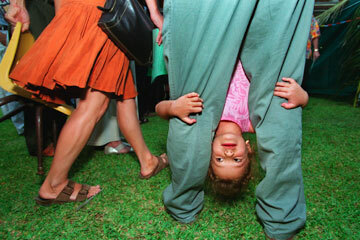 Celebrating the ancient Jewish holiday of Sukkot at Temple Emanu-El, Zoe Robinow hangs onto her father, Steve Robinow. Sukkot commemorates the Hebrews living in the desert while they traveled from Egypt to their new promised land, Israel. Tomorrow, 6:30 p.m. Kol Nidre. Monday, services 10 a.m. to 2 p.m. and 5 to 7 p.m. Break-the-fast potluck will follow. 2550 Pali Highway, 595-7521. Tuesday is the reservation deadline for the Sukkot barbecue. Monday, 9 a.m. Traditional service, 9:30 a.m. Reform service, 2 p.m. Children's service, 3 p.m. Reform afternoon service, 5 p.m. Yizkor and Neilah. A break-the-fast meal will follow. Friday, 6 p.m. outdoor service and Sukkot barbecue.